Senator Elizabeth Warren was in Lebanon, N.H., on Saturday. WASHINGTON — If the 2020 Democratic primary can seem like a race to be most like Franklin D. Roosevelt, with candidates embracing such major government efforts as Medicare For All or a Green New Deal, Senator Elizabeth Warren on Monday pulled a Teddy Roosevelt instead and turned her attention toward the nation’s vast public lands. In a wide-ranging proposal released before a trip to Colorado and Utah this week, Warren called for a ban on new fossil fuel leases on federally controlled land, proposed reversing the Trump administration’s cuts to national monuments, and said entry to all national parks should be free. Warren has peppered her presidential campaign with policy ideas. But Monday’s rollout represents a foray outside themes like economic inequality and corporate greed with which the Massachusetts Democrat is more readily associated. The move injects her brand of populism into a defining and controversial issue in the American West, where about half of all land is owned by the federal government. The plan, which also calls for more production of renewable energy on public lands in addition to its limitation on fossil fuel extraction, also sharpens Warren’s focus on climate change at a time when polling shows it is a predominant concern for Democratic voters. “The Trump administration is busy selling off our public lands to the oil, gas, and coal industries for pennies on the dollar — expanding fossil fuel extraction that destroys pristine sites across the country while pouring an accelerant on our climate crisis,” Warren wrote in a post on the website Medium. In recent years, the Trump administration has shrunk the size of some federally protected lands, including Bears Ears National Monument in Utah; offered up swaths of public land for drilling; and eased protections for endangered species, including the sage grouse, that live in them. Warren called for renewed environmental protections and conservation funding for public lands, including the elimination of an $11 billion backlog in deferred maintenance for national parks. And she called for a revival of Franklin Roosevelt’s Civilian Conservation Corps, saying her plan would create 10,000 jobs funded through Americorps’ one-year fellowship program to “care for natural resources and public lands.” She cast the issue as one that speaks to her broader concerns about advantages for the powerful at the expense of other Americans. “There’s no better illustration of how backwards our public lands strategy is than the fact that today, we hand over drilling rights to fossil fuel companies for practically no money at all — and then turn around and charge families who make the minimum wage more than a day’s pay to access our parks,” Warren wrote. Warren did not specify how she would pay for the plan. Environmental groups praised the proposal. “We particularly like that she wants to harness our public lands to help solve climate change,” said Alex Taurel, conservation program director for the League of Conservation Voters, who said the proposal seemed to be the most specific Warren has offered on climate change in her presidential campaign. In her post, Warren said that as president she would sign an executive order to ban new fossil fuel leases on her first day — a moratorium that would apply to offshore areas as well as federally managed land. The Trump administration is expected to release a plan to expand offshore drilling for oil and gas in the coming weeks, in the face of fierce bipartisan opposition, especially from leaders of coastal states who worry it could do lasting environmental damage that could cause economic harm. Warren’s proposal also contains elements that could appeal to more conservative voters in the West, such as ensuring more public land is accessible for hunting and fishing and calling for state, local, and tribal governments to play a greater role in the management of federally controlled land. The issue of local control over public lands has become a major flashpoint. Bruce Cain, the director of the Bill Lane Center for the American West at Stanford University, said some elements in the proposal could be controversial among conservationists and other groups in the West. Warren’s call to make national parks free, for example, comes as some naturalists worry parks are already being damaged by too many visitors. “You have to be very careful because these parks can easily be overrun and degraded, so if you’re going to go that way you’re going to have to go into some sort of ticketing system,” Cain said. Warren’s call for the nation to generate 10 percent of its electricity from renewable sources on public lands or offshore areas could spark complaints from those who say energy infrastructure like solar panels or wind turbines can damage the ecosystem, Cain said. But Ariel Hayes of the Sierra Club praised Warren’s call that locations for those projects be chosen carefully. “We can achieve this goal while prioritizing sites with low impact on local ecology but high potential for renewable energy generation,” Warren said. Warren is releasing her proposal — and heading back out West — at a time when several 2020 Democrats are seeking ways to stand out among Western voters because Nevada is a key early caucus state and delegate-rich states California and Texas vote early in next year’s primary calendar. 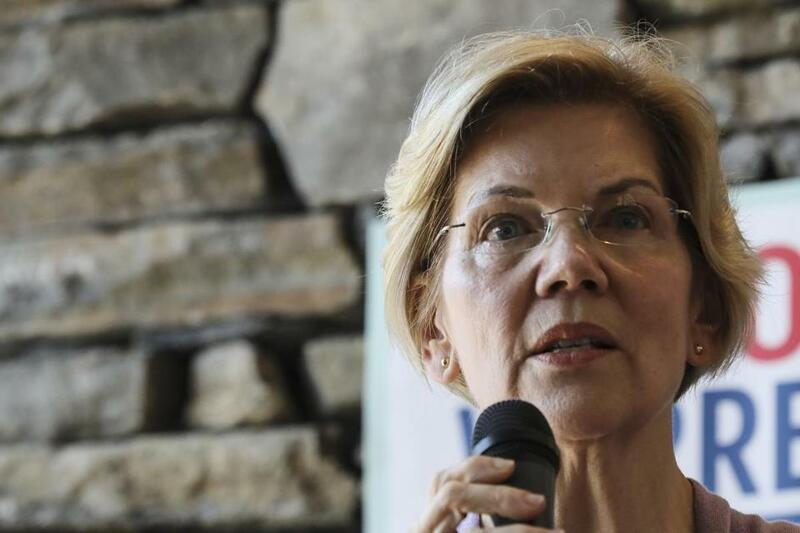 Warren may be trying to signal to voters that she is willing to engage with the issues of the region. Jess Bidgood can be reached at jess.bidgood@globe.com.